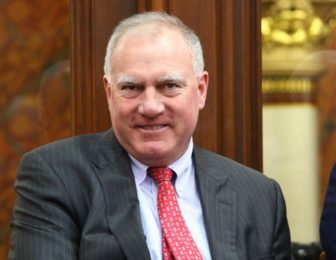 Attorney General George Jepsen, who has been talking with friends about the pros and cons of running for governor in 2018, made it official Thursday morning on a radio appearance: He is going to take a pass on what is likely to remain the toughest job in Connecticut politics for the foreseeable future. Jepsen, 62, a Democrat elected in 2010 and re-elected as attorney general, is now certain to seek a third term as AG, but he made no formal announcement. He did not announce for re-election for his current term until April of 2014. From the start, Jepsen was considered far more like to seek re-election for attorney general than jump into the open race to become governor of a state facing an unfunded pension liability and slow economic growth that will create difficult fiscal choices for years to come. “The test I gave myself all along was when I wake up in the morning and look in the mirror, do I see somebody who wants to be governor so badly, and for the right reasons, that I’m willing to put up with all the misery of running to get there?” Jepsen said in a telephone interview. “And I love my current job,” Jepsen said. Jepsen made his announcement on the Chaz & AJ show on WPLR, an FM radio station. Jepsen, a former Senate majority leader and Democratic state chairman, said the fiscal challenges facing Connecticut mean every candidate should run with the assumption they will be a one-term governor. Comptroller Kevin P. Lembo is the only statewide official who has formed an exploratory committee for governor. Lt. Nancy Wyman is expected to say in the next month if she will try to succeed Gov. Dannel P. Malloy.